The Safety-TL4896, a SIL2 rated temperature measuring device from Martens, conforms to international boiler regulations and offers a unique front panel installation. Certified to DIN EN14597 and DIN EN61508, the device gives an analog actual value output for regulators and PLCs that eliminates the need for additional sensors. It is available from GHM Messtechnik South Africa. “The Safety-TL4896 is the first safety temperature measurement device in the world designed specifically for application in industries using boiler technology,” said GHM Messtechnik South Africa managing director, Jan Grobler. “I believe the device will generate enormous interest from plant operators in sectors such as pulp and paper, food and beverage, pharmaceutical, sugar and dairy. In boiler applications for hot water production, a safety temperature limiter must be provided in addition to the limit value and minimum water level monitors in order to suppress the energy supply in accordance with DIN EN 12828 – whether by means of deactivating the automatic firing device with ignition flame monitoring (gas operation) or a safety valve (oil supply) or a heating current interruption – as soon as any of the limiters react. With self-sufficient device technology as required by DIN EN 61508 “Functional Safety”, i.e. independent of PLC, regulating or scada systems, only the permissible safety temperature limiters are used for industrial heat generators in accordance with DIN EN 14597, and the functional safety level requirements in accordance with SIL2. Combined heat and power plants require safety temperature limiters for self-sufficient monitoring of the hot water, over-temperature of motor preheating, motor cooling water, exhaust gas and calorific value heat exchangers. 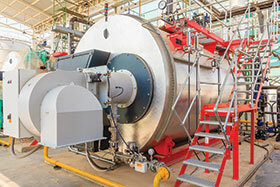 In hot steam production, additional safety elements must be used in order to monitor boiler systems equipped with over heaters. The Safety-TL4896 safety temperature limiter has a safety shutoff contact and an adjustable pre-contact in order to warn of impermissibly high actual values independently of the regulating and control device. Before the forced shutoff is activated, additional alarm messages can be issued and corresponding functional processes can be initiated in order to achieve a safe standby status, eliminate errors and avoid time-consuming and costly shutdowns and subsequent restarts of the plant. The high-quality analog output of the actual process value offered enables further processing in the automation system and eliminates the need to install an additional sensor. Electronic safety temperature limiters were previously often built as top-hat rail devices in switch cabinets. Now, for the first time, the device offers installation in the front panel. In the process, the actual and limit values on the large display can be read conveniently and the reset process, after correction of the cause of an error, takes place on the front panel in the same manner as for all other operating processes. As a result, separate devices and their wiring can be eliminated as their functions are already integrated: indicator and reset button. With the adjustable pre-alarm, no additional limiters are needed and redundancy to the automation unit is provided. A second additional measuring chain is eliminated by the analog output. The Safety-TL4896 can be configured with the front buttons and tailored to the specific application. Particularly with small and compact systems whose complete automation electronics are contained in the operating device (e.g. with use of the GHM-One multi-function device, or a compact industrial PC/PLC system), there is no longer a large, conventional traditional switch cabinet. As a self-sufficient front panel unit in slim DIN format 48x96, the new Safety-TL4896 enables consistently compact design of modern small systems, reduces the wiring and facilitates ergonomic operation in the monitoring and observance of safety requirements. The unit also offers time and cost advantages in wiring and installation. With easy operation from the front, the requisite safety functions and ergonomic operation of safety temperature limiters is fulfilled for the first time.